Was one of your New Year's resolutions to learn a new skill, quit a bad habit, meet new people, or just relax? Well have I got a one step solution for you: KNITTING! 1. You don't have to learn to knit a sweater right off the bat. Instead, learn something simple like a dishrag or a scarf. 2. You do not have to be an artist to learn to knit. Out of all the ways I could be described, "crafty" is not a word that would be used. 3. You don't have to start when you are young. I actually learned from a group of lovely ladies at our church by joining our Prayer Shawl Ministry. I had no idea how to knit prior to attending that first meeting. Helps keep fingers nimble - those that suffer from arthritis can benefit from the movement. Crushes cravings - your hands are not idle which can result in a replacement for addictions like smoking or eating. Equalizer - you can knit at any age, whether you are a man or a woman, and you can knit anywhere. Learning tool - there are visual, aural, and kinesthetic learners as well as combinations of all three. Some teachers are using knitting and other handicrafts as teaching tools for kids that learn better by doing. Sense of accomplishment - that feeling when you finish a project is almost euphoric. It is so cool to sit back and admire what happens when a couple of needles, some yarn, and time all come together. Gifts - if for nothing else, the fact that you can make meaningful gifts for those you love is a pretty neat byproduct of the process. I had a pretty muted purple skein of yarn and thought it would make a nice scarf so I made up this non-pattern. Much like my non-recipes that are very much by tasting, this non-pattern is very much by seeing. 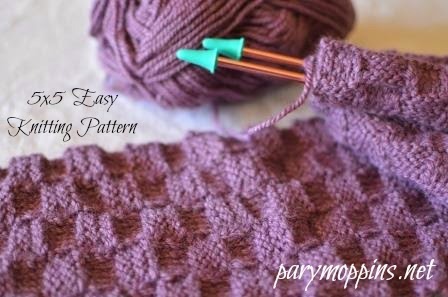 This simple non-pattern will continue until your scarf is the desired length. If you knit it short, you could use it as a dishrag or facecloth depending on if you used cotton yarn or not. If you cast on more stitches, you could turn this pattern into a place mat - just make sure that you cast on a multiple of 5. This is so simple, flexible, and adjustable. I call it 5 x 5 because each stitch is repeated 5 times for 5 rows. It makes a sort of basket-weave pattern with ever-so-slightly ruffled edges. Repeat Rows 1-10 five times to make a dishrag or facecloth. 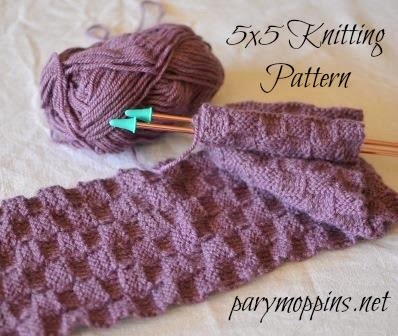 Repeat Rows 1-10 until you have reached the desired length of your scarf. I really want to learn to knit. In fact, knitting is on my bucket list. Basket weave is one if my favorite patterns! And I didn't learn how to knit until after I had my twins. Printed it for my daughter, she can knit and crochet anything. She's in nursing school and it relaxes her after a hard day in bio-chem! Thanks for sharing your pattern! I hope your daughter likes it. :) it's such a simple pattern but the repetition is very relaxing.